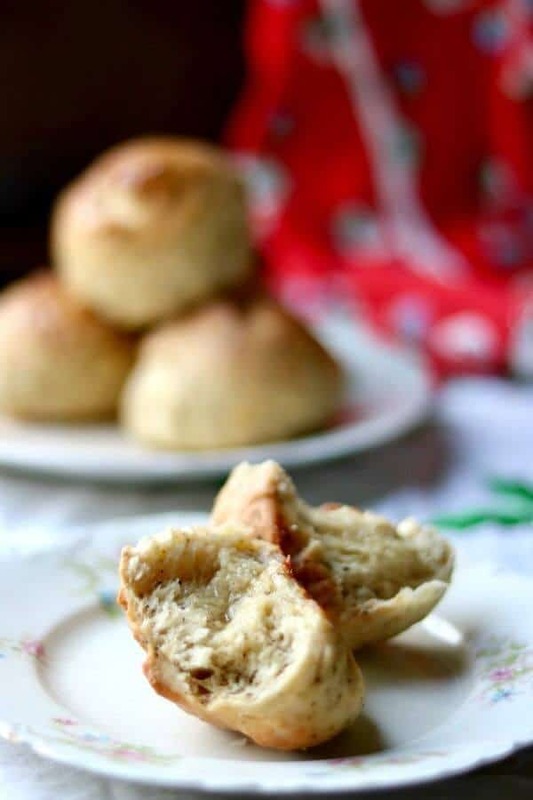 These easy cheese dinner rolls have been around a long time and it’s not surprising. Tender, buttery rolls with a cheesy black pepper blast can be addicting. 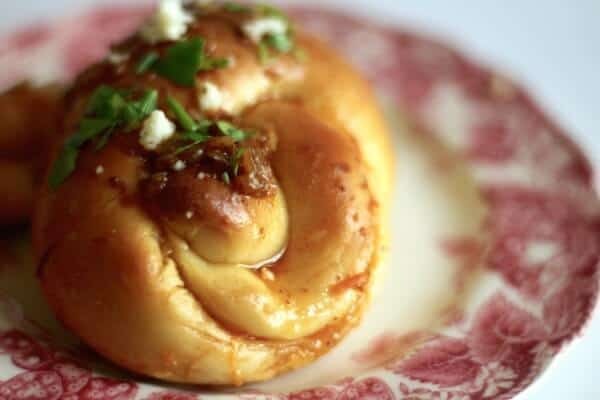 You can shape them into large hamburger buns, smaller sandwich buns, or anything-but-plain dinner rolls. Use a sharp Cheddar and freshly cracked black pepper for the most flavor. 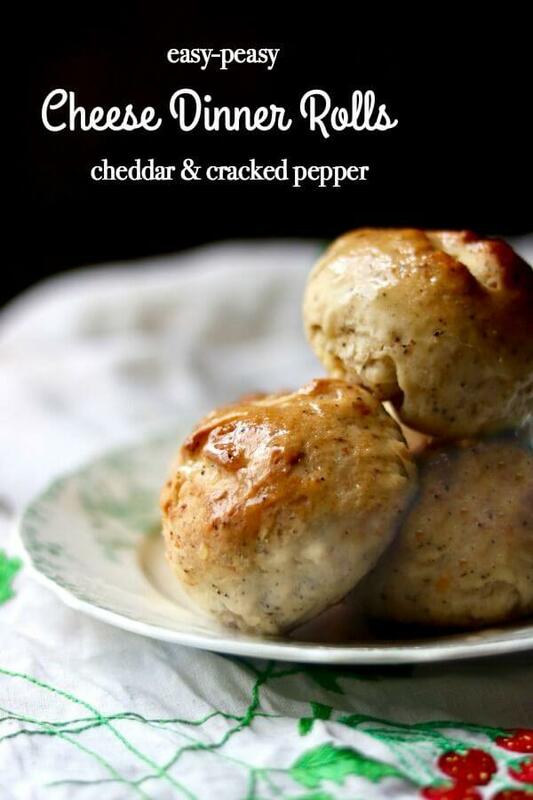 Cheese and black pepper dinner rolls have graced our dinner table more than once but I tend to forget about them. All of a sudden I’ll get hungry for that sharp cheddar and spicy pepper flavor and dig this recipe out. I have no idea why I didn’t share it years ago! Easy cheese dinner rolls are literally foolproof if you have a good stand mixer. Just make sure to let the dough rise in a warm place and keep your liquids at about 110F when you’re mixing them with the yeast. In fact, I did a series on bread baking tips a few years ago that you might find helpful before you start. We have had the warmest winter that I can remember. I think we got a dusting of snow once or twice but for the most part the weather has been in the 70s and 80s. I mentioned to my husband that I didn’t think I’d worn my coat at all. While I do love this gorgeous weather it makes it hard to want to make the comfort foods I love. It’s more like homemade ice cream and burgers on the grill kind of weather, you know? I haven’t made bread nearly as much as I normally do because of it. I have a container (you can’t really call it a canister) that holds 50 pounds of bread flour and I usually go through that in a couple of months. This year it’s still pretty full. I just keep a couple of bay leaves in there and I haven’t had a problem with bugs. Sometimes those old remedies work! Although it didn’t use up much flour this recipe got made twice recently. The first time I made them I stopped and took pictures of the dough rising. I meant to get some pictures of the dinner rolls themselves but they disappeared in seconds. It was like a feeding frenzy in a shark tank. So, I made them again and carefully put a few of the prettiest ones away so I could get pictures. You’ll notice the unbaked rolls are different shapes than the unbaked ones. 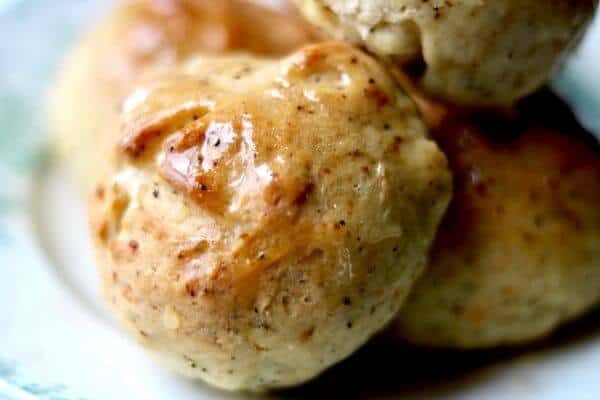 If you’re looking for something delicious to serve with stews and hearty soups these easy cheese dinner rolls are perfect! The texture is soft and chewy like a baguette rather than light and airy. That means you can sop up gravy or the last of the broth or whatever without your roll falling apart on you. With each bite that sharp Cheddar cheese demands attention and just when you think that the flavor is gone the black pepper steps in! Vital wheat gluten is a wheat protein that helps breads and rolls rise high and fluffy. It doesn’t take much! I highly recommend it, especially if your breads tend to come out coarse or dry. I go through so much yeast that I get it in a 2 pound package. I’ve never had it weaken on me. 4-1/4 cups bread flour, you may need anywhere from 4 to 5 cups. Add the yeast, water, and 1 teaspoon of the sugar to the bowl of a stand mixer fitted with a paddle. Set aside for about 5 minutes, or until foamy. Mix the remaining sugar, bread flour, and vital wheat gluten – set aside. Add the milk, pepper, and 1 cup of the bread flour mixture to the foamy yeast mixture. Beat on low to blend. With mixer on low add the butter, egg, salt, and cheese. Remove the paddle and switch to the dough hook. With the mixer on low slowly add enough of the remaining flour to make a soft dough that pulls aways cleanly from the sides of the bowl. With the mixer on medium (or as recommended by the manufacturer), knead the bread for 3 to 5 minutes, or until stretchy and elastic. Pull the dough out of the mixer and put it on a floured countertop. Knead by hand a minute or so just to make sure the texture is right. 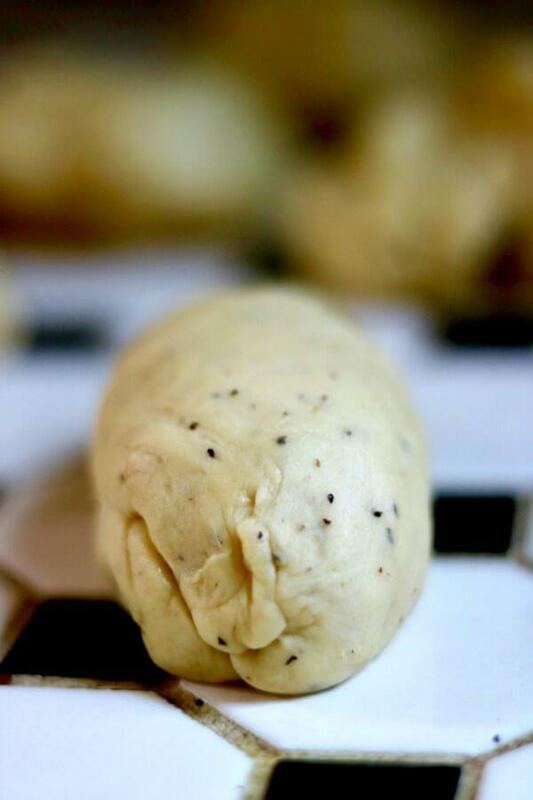 When dough is kneaded enough it will feel like an earlobe when you pinch it. Put the ball of dough into a large, greased bowl. Turn to grease the top. Cover with a clean towel and let rise in a warm place for 30 minutes. 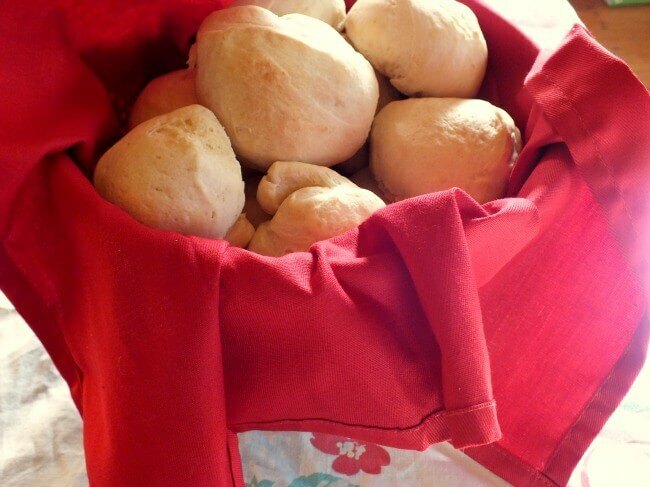 Remove the dough from the bowl and gently shape into dinner rolls. Place rolls on a silpat or parchment covered baking sheet, brush the tops gently with melted butter. Let rise in a warm spot for 30 minutes or until doubled. Bake in a 375F oven for 15 to 20 minutes, or until golden. Interior temperature will be 185F to 190F. If you like a crispy crust let it bake until the interior temperature is about 200F to 205F. An probe style insta-read thermometer is perfect for this. Remove the rolls from the oven and brush with butter. 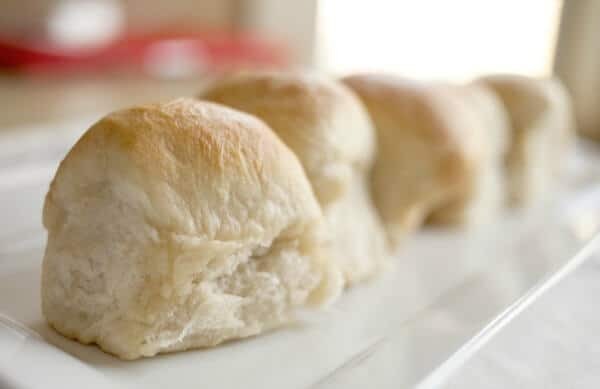 These rolls can be made ahead and frozen for up to three months. Marye, Those sound divine. I’ve yet to take the plunge and get a stand mixer. Crazy, I know.The other flavor combination similar to this that I love is sharp cheddar and cayenne. There’s just something about it…. oh that’s one of mine, too! I’ve kneaded these by hand before – it can be done. It’s just I have some arthritis in my hands now so it’s harder.